Home / Alias / mid season / Paul Scheuring / Prison Break / Rambaldi / Revolution / Scott Michael Foster / serialized dramas / The Da Vinci Code / The Following / Vanished / Zero Hour / ZERO HOUR: Is there really room for another serialized show? ZERO HOUR: Is there really room for another serialized show? Zero hour is like National Treasure meets The Da Vinci Code with reincarnated killer Nazis and a stolen Alias plot line thrown into the mix. Zero Hour premieres Thursday February 14th on ABC and first of all, launching this show on Valentine’s Day seems a little odd… just saying [I get scheduling Grey’s Anatomy or Beauty & the Beast even Scandal, but this show? It doesn’t really scream ‘romance’ does it?]. Anyway… Should you watch it? The show revolves around the editor of ‘Skeptics’ magazine, who is a guy that makes a living debunking urban legends. So he is sort of a ‘myth buster’ without the cool stunts. Ironically (and predictably), he is pulled into the middle of a conspiracy after his wife is kidnapped by a group of mysterious characters who are after something hidden for centuries by the Rosacruces. All we know is that it has something to do with a treasure map, a creepy white-eyed man and eternal life. I was expecting it to be a total bust but it is actually not that bad. I wasn’t bored during the pilot, but I wasn’t wowed either. Paul Scheuring is in charge of the show. His previous work includes Prison Break, which was one of my favorite shows of all time. However, Zero Hour is not really like it. The only similarities I could find were the map printed in an unconventional place and that they have a cool graphic sequence before the act breaks. And that is all I could come up with, so marketing this show to the Prison Break fans is not going to happen. My problem with the show is that it feels very derivative. The connection with The Da Vinci code is pretty obvious, but I will let it pass since I never thought The Da Vinci code was particularly original either. However, the show does feel like every other treasure hunt movie or TV show ever made and there was something about the cinematography and the tone of the show that made me think of The Event (I am not really sure where I got that connection, but it’s there). Plus the whole ‘clock with a mysterious map and mysterious clock-maker from a foreign European country’ is flat out a stolen plot from Alias. Stay with me, I am not making up this parallel, I swear. On Alias Sydney Bristow was in a constant quest to ‘bring forth’ the works of a 15th century Italian prophet Milo Rambaldi, who had hidden his artifacts across the world. 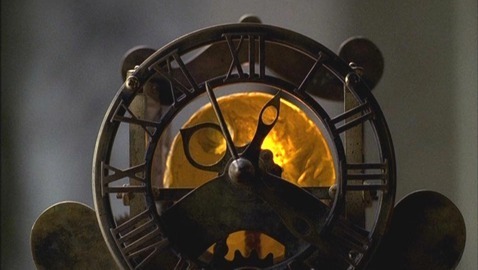 One of his artifacts was an ancient clock (exactly like the one of Zero Hour) which could be paired with a golden glass disc revealing a map. It was a cooler map since it was a star chart that led them to a location in Argentina… see cooler. Anyway, Sydney also went looking for the ‘clock maker’ who was an old Italian, mysterious dude, much like the one on Zero Hour. In addition, Rambaldi and the clock maker seemed to posses the secret of ‘eternal life’. Having one or two similarities may be an accident, but that entire plot line was a little too similar for my taste. Rambaldi Clock ALIAS "Time will tell"
The comparisons don’t end there. The show that Zero Hour reminded me the most was Vanished. Which is also a treasure hunt show jump-started by a kidnapping and involving a maybe-religious conspiracy. It was cancelled after only one season, and I have a feeling that may be the case for Zero Hour as well. But I could be wrong, I’ve read articles suggesting it may be competing to be the ‘Next Lost’ along The Following and Revolution. Yeah, I don’t think so. If any show is the hit of mid-season is The Following, and Revolution had a solid start. Is there really room for another serialized drama? I am a huge fan of serialized story-telling. I would gladly eliminate 10 of the million procedurals currently on TV to have some more complicated serialized shows. But I love getting involved in the plot-lines watching religiously every week and speculating online. However, not a lot of people are like me. So, for a serialized show to become a hit it has to be very very good. Is Zero Hour very very good? I don’t think so, it is not bad either. I think the pilot is worth watching, and maybe a couple more episodes to see where it goes. It could get interesting, too soon to tell.